For groups of 6 and more: Design an itinerary based on your group's time constraints, budget and fitness level. To get the ball rolling, simply fill out our "Biking a la Carte"
As you might well imagine, the whole customized-tour creation process takes time. We have the knowledge and expertise, but delivering your perfect dream trip also requires research and legwork. Thankfully, no point in Europe is really far from Geneva where we are located (in France, right across the border). To start the whole process, you should give us as much as possible about the ideal trip… mileage, etc… this can be done through our online form. Note: 3rd experience with Cyclomundo! Declan and his group of Irishmen are busy guys! After doing a few days of cycling in the Alps back in 2013 (we provided transfers and bikes) then a short custom trip with us in the Pyrenees the following year, they contacted us again to organize a 5-day jaunt in Provence for 2017. They wanted some good distances and climbing for their days on the bike and comfortable accommodations for their nights in town—a pretty nice plan, we think! Using our existing 8-day Avignon to Nice trip as a base, we cut and combined routes to maximize the group’s time in the stunning, sunlit region. As Declan had told us that they could fly into Marseille and out from Nice, we had them starting from the town of Sault and finishing in Saint-Paul-de-Vence, arranging transfers to smooth the arrival and departure processes for them. A blend of moderate and challenging rides took them through fragrant lavender fields, the gorgeous natural parks of Luberon and Verdon, the exciting Col de Murs and the Gorges du Loup, and lovely Provençal towns like Gordes, Forcalquier, and Moustiers-Sainte-Marie. Note: 5th tour with Cyclomundo! Paul and his group of 11 riders are seasoned Cyclomundo veterans! For their 5th custom cycling trip, they wanted to have a support vehicle to accompany them as they took on some new challenging climbs. Using our local expertise, we crafted a trip using routes we know well in the French and Italian Alps. The final itinerary had them weaving between the two countries, starting in Saint-Jean-de-Maurienne and finishing in Nice. Accompanied by our guide Pascal, the group conquered some major passes like Galibier, Izoard, Agnello, and Bonette while enjoying magnificent views of sweeping alpine landscapes and quaint villages nestled in lush valleys. To complete the package, we arranged accommodations, luggage transport, and arrival and departure transfers, as well as providing support during the trip. From their feedback, they had an awesome trip– which is what we love to hear! After taking part in one of our Geneva to Alpe d’Huez trips in 2013, Canadian rider Andrew had such a great experience that he brought his friends along with him 3 years later for a custom trip to really push themselves and test out some climbs in the Pyrenees! For this bunch of avid cyclists, we pulled out all the stops, building on existing routes to include all the major climbs in their itinerary, including Col de la Core, Col de Menté, Col d’Aspin, Col de Peyresourde, Col du Tourmalet, Col d’Aubisque, and Col de Marie-Blanque. For most days’ rides, we even created longer and more challenging options so that they could get even more climbs and passes in! And because even the most motivated legs need some recovery time, we mixed in a few rest days throughout the 9-day trip—though they were, of course, welcome to ride the loop routes we mapped out. Although the group opted to do the tour on a self-guided basis, we organized arrival and departure transfers for them, taking the logistical hassle off their shoulders. As we also took care of booking accommodations, luggage transfers, most meals, navigational materials, and bikes (for those who didn’t bring their own), they were free to simply focus on the cycling challenges and breathtaking landscapes ahead of them! 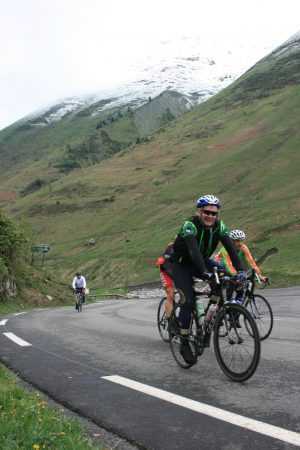 And what a feat—from Saint-Girons to Lurbe-Saint-Christau, they covered an impressive 525 kilometers (326 miles) and 12,951 meters (42,490 feet) of climbing in the “mythic” mountain border between France and Spain. From their feedback, they had a fantastic adventure in the Pyrenees, with some particular appreciation of the delicious French cuisine. We’re currently working with them to arrange another custom trip for 2018—this time in the Dolomites! Group leader Peter reached out to us a year in advance, giving us plenty of time to customize the perfect cycling trip for his enthusiastic group of Australians! These clients knew what they wanted for their tour in the south of France: warm weather, quaint lodgings, delicious meals, good road bikes, moderate-challenging cycling, and a variety of routes—no problem! With all that in mind, we worked with Christine, our local partner in the Dordogne, to modify existing routes from standard and custom itineraries to put together a 14-day exploration of the region. As the clients wanted to spend more time in each town, we provided optional loop rides for them to discover the area—or they could take a rest day and relax. Considering the group’s size, we also arranged a support vehicle with guide Damien to accompany them and provide increased flexibility throughout their adventure. In the end, the clients enjoyed around 70-100 km of cycling per day; stayed in charming hotels and guesthouses in historic towns like Les Eyzies, Sarlat, and Rocamadour; and dined like French royalty on rich Périgordian cuisine. Damien reported back that the group was very happy with their tour—further evidenced by the fact that several riders have since returned to book other trips with us! 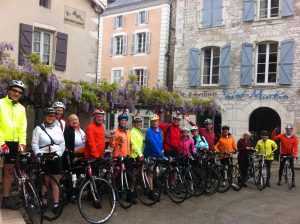 This group of adventurous cyclists from Ireland wanted to tackle the mythic climbs of the Hautes Pyrenees! Using an 8-day itinerary we had run in the past for private groups in this area, we tweaked it to fit this particular group’s schedule and needs, taking into account their time limitation (5 days) and the variety of cycling levels within the group. The final itinerary had them wheel off from Oloron-Sainte-Marie and finish in lovely Saint-Girons… with plenty of hard work and spectacular views in between! Each day, mythic Tour de France climbs awaited the most avid riders (including Col du Tourmalet, Col d’Aspin, Col de Peyresourde, and Col de Menté); while those wanting to take it a little easier could choose to enjoy our less strenuous (though no less exciting) option. And as they opted to do the trip with a support vehicle, the group could count on our trusted guide Vincent to provide assistance from beginning to end. This is a brief note to say thanks for a great trip on behalf of all six of us. The routes you chose had the right element of challenge, scenery, and interest to suit all tastes and the alternatives provided also enabled a further level of variety (and sympathy in places!). The accommodation was also very agreeable and in particular, the meals we had were particularly good in all the locations – indeed many were simply outstanding. We all agreed that we would like to draw your attention to the service provided by Vincent. He is a most agreeable young man, was interested in all aspects of our trip and did his utmost at all times to enhance our visit to the Pyrenees. He is definitely someone who richly deserves praise and he is a huge asset to Cyclomundo. Note: 3rd trip with Cyclomundo… and more since! Since their first custom trip with us in 2010 in Provence, this awesome group of Canadians has joined us for more specialized tours in the Dolomites, Bordeaux, and the Alps. Each time, they’re looking to challenge themselves and get in some quality miles, as well as immerse themselves in the region by cycling along its quieter roads and staying at small or family-owned properties. While they often come to us with some specific rides or climbs in mind, it’s not just a cycling route they’re seeking, but a complete authentic experience. For their third tour with us, Craig and his cycling buddies were interested in experiencing northern Italy—riding the Veneto and Dolomites with a good mix of big climbing days and easier days on gentler terrain. 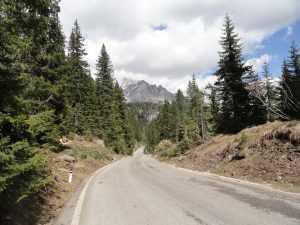 Putting together preexisting routes in the region and using our knowledge of the area, we came up with an itinerary that provided plenty of opportunities to appreciate the stunning landscape, take in the Italian culture, and feel the burn on tough passes including the Sella Ronda route, Passo Tre Croci, and Passo Giau! Over these 9 days, such lovely towns as Valdobbiadene, Cortina, and Belluno were their home, as they cycled between mythic mountains and lush agricultural valleys. Logistics also played a part in mapping out their route and maximizing their time in the saddle; by having them start off from and finish back in Treviso, airport transfers from and to Venice were kept short, allowing these avid adventurers to live their trip to the absolute fullest. July 2013 – Group from Australia – Etape du Tour, French Alps, and Ventoux! Mike contacted us with an ambitious project in mind—a custom tour beginning with a thrilling ride in the Etape du Tour cyclosportive, followed by some serious cycling in the French Alps, which would then see them in a good position to view a stage of the Tour de France, bringing them around full circle! Needless to say, we were excited to help them organize such a fun (and envy-inducing) trip. The group had already taken a shining to our standard “Geneva to Alpe d’Huez” trip, and so from communicating with them and working from that tour as a base, we modified the existing routes, provided some ride options for flexibility, and added a couple of deserved rest days to extend the trip to 12 days. From the whirlwind Etape in Annecy, they went on to take on some mythic climbs in the Alps including Col de la Croix-Fry, Col des Aravis, Col de la Madeleine, Col du Télégraphe, Col du Galibier, and Col de la Croix de Fer. We then transferred them to Provence, where they got to watch Chris Froome take Stage 15 of the Tour de France (Givors to Mont Ventoux)—and later complete the ascent up Ventoux themselves! As they had wanted a fully supported tour, they had the assistance of our guide and vehicle throughout the entire adventure, allowing them to really take in the incomparable cycling and atmosphere found in France—especially when the Tour is in town. From what we heard, it was the experience of a lifetime! This athletic group wanted to see the Alps from an Italian perspective, and boy did they ever! Landing in Milan, an easy to access the airport, we picked them up and took them to Bormio, the base for their trip. While we often use a number of accommodation locations so clients can see more “on the move”, we were able to design this 5-day trip around just one accommodation and one location, Bormio. This allowed the group to really settle in their charming hotel, but not without exciting and unique rides each day! Type of tour: Moderate cycling tour with a support vehicle. Some sections are done on a self-guided basis. Allow them to experience the awe of the French and Swiss Alps with minimal climbing. Allow them to watch some of the Tour of Switzerland, a professional bike race which serves as a precursor for many eventual riders in the Tour de France. Design the tour so as to allow them to ride self-guided on some days, and be followed by a support vehicle on other days of their choosing. No problem. Using our tour-expertise, we organized an epic 14-day tour for them based specifically on their requests. Beginning and ending in Geneva, their tour followed a leisurely route without sacrificing any alpine scenery. Over the course of their 14-day ride, they visited Interlaken, one of Switzerland's, if not Europe's, most beautiful mountain destinations. Other high-five stops included the resort town of Le Grand-Bornand, Saint-Jean-de-Maurienne, Aix-les-Bains and the medieval village of Yvoire. Their carefully planned route allowed them to ride at a leisurely pace, giving them ample time to watch selected stages of the Tour of Switzerland, as well as visit many of the historical and cultural attractions suggested by us. Type of tour: Super challenging with a guide! In 2010 this gung-ho group from Norway enjoyed a customized version of our famous Geneva to Alpe d'Huez, which was recently hailed by Outside Magazine as the "2011 Trip of the Year." They returned in 2011 more ambitious than before. This time they requested a customized tour long on miles and big on climbs, and that would allow them to catch a stage finish of the Giro d'Italia, second to only theTour de France as the world's most prominent bike race. They asked and we delivered. Upon arriving in Geneva, our home base, we outfitted them with bikes before shuttling them to Pinerolo, Italy. There they witnessed the penultimate stage of the Giro – Verbania to Sestriere – with its dramatic finishing climb. Inspired, they began riding themselves. 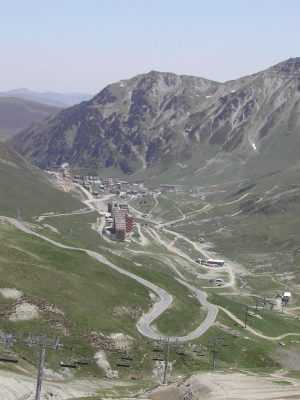 Their route, which we carefully designed based on their suggestions, allowed them to experience some of the Tour de France's most storied climbs: Col du Mont-Cenis, Col d'Iseran, and Cormet de Roselend. Following two memorable customized tours with us, this happy group of Australian riders returned with an eye on northern France. Based on their suggestions, we used our expertise to package them a self-guided tour along the Normandy coast. We planned every detail of their tour – route, lodging, dining, suggested attractions – while honoring their request for a leisurely pace by limiting their daily rides to approximately 45 kilometers. Their route, which began in the picturesque harbor town of Honfleur and ended along the historic D-Day landing beaches, allowed them, based on their timeframe, to fully experience Normandy's culture, cuisine, history, and rustic beauty. And by all accounts, the tour met and exceeded their expectations. Geoff, the group's organizer, wrote: "I want to pass on thanks for arranging our tour. The accommodations were excellent. All were situated in great locations and were of high quality. We especially enjoyed the Château and Nancy's B & B, and the service at the Churchill Hotel in Bayeux was outstanding. Your chosen restaurants added to our adventure by allowing us to experience a vast variety of local cuisines. And I especially can't say enough about our meal at the Château. It truly was exceptional! The route you chose for us was perfectly planned. It covered countless places of beauty and interest. The mix of tiny villages, scenic country roads, and reflective historic sites maintained our interest for the entire tour." Looking for the trip of a lifetime, this group of 7 happy cyclists combined their passion for cycling with ours. We designed a 12 night 13-day adventure through Provence and Languedoc that took them to see Pont-du-Gard, Roussillon, Les Baux, Gordes, Saint-Guilhem-du-Desert, and the Cirque de Navacelles. The trip was sculpted from a dialogue with the group leader into the eventual route which can only be described as an interactive work of art. Ever the cyclist, Bruno accompanied the group as their guide and had almost as much fun as the group did! They got the vacation of a lifetime and we got to share the best of what Provence and Languedoc had to offer. Their feedback says it all: “I would like to thank you for organizing such a wonderful trip for us …The planning, routes and overall organization were wonderful. It was a fabulous ‘holiday’, even if it was ‘a little bit tougher’ than lying on a beach drinking cocktails.” Couldn’t have said it better myself. Andalucia is an extraordinary land for cycling - as have discovered This group did a week-long cycling trip in Andalucia this group of 10 Irish cyclists who traveled with us on a supported basis. Over time, the program was finalized to satisfy this multi-national group of 20, made up of non-riders and riders of various fitness Our itinerary took this group through Saint-Emilion and its famous chateaux levels. Our 4-day program included accommodation amidst the vines at the prestigious 4-star spa hotel, "Les Sources des Caudalies", and was designed to give everyone exposure to the wine-growing areas of Sauternes, Medoc, and Saint-Emilion. The cycling routes took place on small roads through these wine areas with the guidance of Didier, our local bilingual cycling guide and wine expert. For their fourth custom tour with us (after Provence, Riviera, and Dordogne), Patrick, our local contact concocted an “expert route” that took them all around Normandy. In a matter of 8 days, they saw it all: Honfleur, the Flowery coast, Bayeux, the D-Day landing beaches, Mont-Saint-Michel, Saint-Malo, to name a few. A cycling tour through scenic Tuscany, these smiling riders were accompanied by their non-riding spouses, they opted for a supported tour in Tuscany. The customized itinerary was based on riders’ ability and fitness levels. While the guys rode, their wives were driven to small towns for shopping and admiring fields of sunflowers! Have a look at these 5 cyclists and then have respect! They’ve accomplished a challenge that for many just the mere thought is painful! Imagine - they started with the challenging cyclosportive "La Marmotte" which they finished more than honorably, then they kept going for two weeks before tackling “Les Galériens du Ventoux” challenge on their last day. What that means is that they climbed Ventoux 4 times - from the 3 sides, most people know of and from the 4th way over an unpaved forest road! Oops! We forgot to add that in between they climbed no less than 100 cols! You may view the group's website here. Type of group/client: Charity ride for "Get Up for Ghana"
The Geneva representative for "Get Up for Ghana" contacted us to organize a one-day charity ride. The goal of this Paris-based organization is to help Ghana orphans. This New-Zealand-based travel agency asked us to organize a 2-week tour in Burgundy and Provence on a self-guided basis. In addition to their requirement for providing exposure to “authenticity,” they also wanted two daily cycling options, in order to cater to riders of various levels. The toughest option included Mont-Ventoux "the classic way" from Bedoin. To meet this group leader’s criteria, we found “out-of-the-ordinary” accommodations, such as the exquisite Moulin de la Beune and La Maison Jeanne, in the quiet "Vallee d'Oueil," a few kilometers from Luchon. Photo courtesy of client (Bonnie Swenby). A group of 12 Israeli cyclists wanted to see and do it all... Ventoux, the Verdon Canyon, Saint-Paul de Vence, the Riviera, the Alpilles, the Luberon, etc... They did it all. Our 8-day trip took them from Marseille to Marseille via Cavaillon, Sault, Moustiers, Castellane, Vence, Le Paradou. Cyclomundo organized the whole logistics for the group: routes, support vehicles, luggage transfers, etc.. This multi-national group of American, British and Australian exparts from the Netherlands and from the US did it all! Over a few days' vacations, they covered all the major Tour de France climbs: Croix-de Fer, Telegraphe, Galibier, Alpe d'Huez, and Ventoux! Are currently being under work for 2007: A Bordeaux to Perigord trip for a group of 14, a combination Burgundy and Provence trip for a group of 26; A combination Dordogne and the Pyrenees for a group of 8; and a Languedoc to Dordogne trip. Ready to add yours? Just fill out our booking form. "You put together a trip for 9 of us in the Lot Valley in May. We informed you of where we wanted to go, how many days we wanted to ride, and the distances we wished to ride each day. Although the bicycling experiences and abilities of our group varied widely, the trip exceeded every expectation for all - the traffic was light, the scenery varied, the hotels superior, the meals simply wonderful and the cost most reasonable... Thank you for a great trip. We have already recommended you to others. I suspect you are busy coordinating your Tour trips, so there is no need to respond to this message, but I did want to let you know how happy we all were with our ride." Their trek, which Peter named the "Tour des Grimpeurs," followed a scenic course that wheeled them from Grenoble to Nice. Along the way, they experienced epic climbs such as Alpe d'Huez, Galibier, Glandon, Télégraphe, Izoard, and Madone. In addition, they visited the Gorges du Verdon (France's Grand Canyon) as well as world-famous villages such as Saint-Paul-de-Vence and Villefranche-sur-Mer to name a few.